The necropsy examination is a fundamental skill necessary for the diagnosis of poultry diseases. 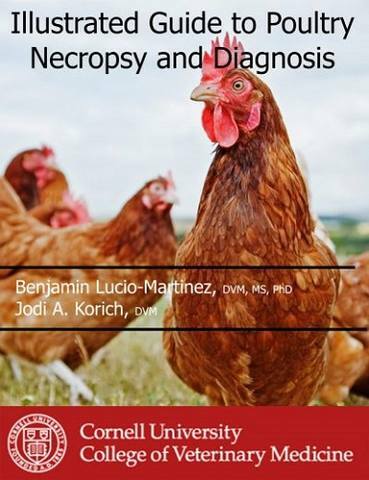 The primary purpose of this book is to provide veterinarians and veterinary students with an illustrated overview of the necropsy in poultry. The guide begins with a series of anatomical illustrations, providing a brief introduction to the clinical anatomy and relevant terminology. Chapter 2 covers the personal protective equipment and supplies necessary for performing field necropsies. In chapter 3, photographs guide the reader through the steps of the necropsy exam, using images of healthy chickens as a reference for the appearance of normal, healthy tissues. Also integrated into this chapter are instructions on how to collect high-quality diagnostic specimens during the post-mortem exam. The proper method for categorizing, packing, and shipping these patient specimens to a diagnostic laboratory is detailed in chapter 4. Finally, chapter 5 provides a selection of images depicting gross pathologic lesions. This chapter is intended to serve as an introduction to some of the most common or clinically important gross lesions observed in poultry.